Lemon tart with burnt meringue and citrus sorbet, on the menu at Suttons Beach Pavilion. 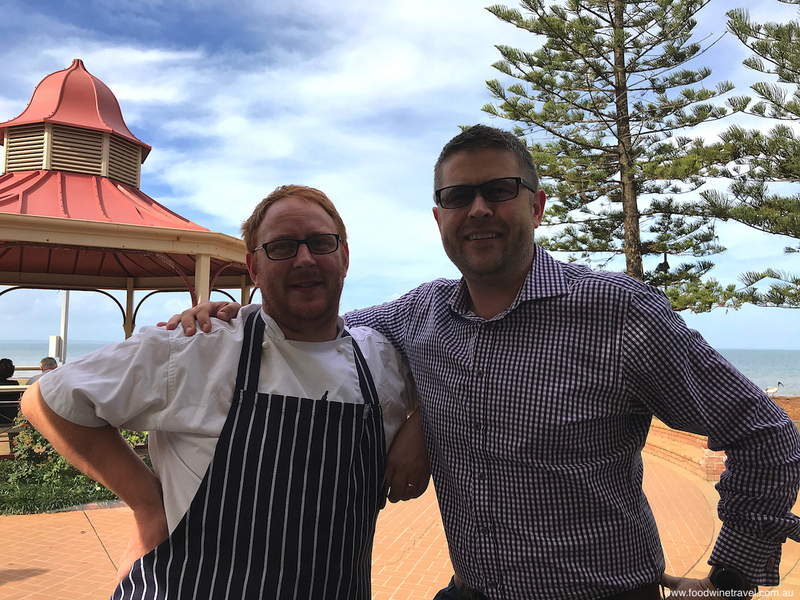 The new chef and management team behind Suttons Beach Pavilion have a big dream – to make it the best restaurant on Redcliffe Peninsula – and you get the feeling that if anyone can succeed in achieving that goal, they can. Since Darren Eaton, Sandra Duncan and Oliver Thomson took over in early 2017, they have already made an impressive number of changes to the Pavilion. 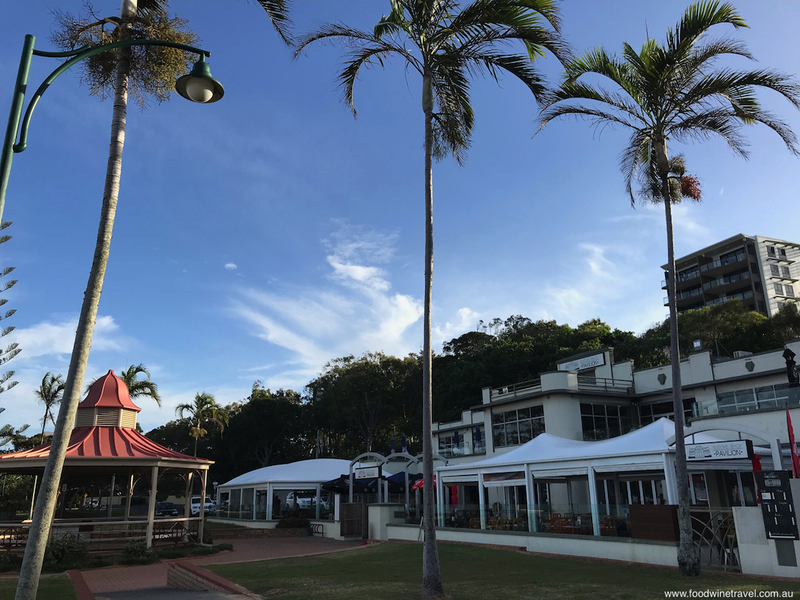 Their efforts have not gone unnoticed by Peninsula locals and it’s great to see more and more people flocking to the Pavilion for fish and chips, coffee and cake, drinks and tapas, or a meal. Chef Michael Harris and Suttons Beach Pavilion co-owner Oliver Thomson. 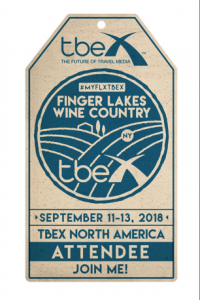 With the appointment of chef Michael Harris, even greater changes are afoot, with a focus on bringing the food up to a standard that will draw visitors from near and far. Harris wants the Pavilion to become the Peninsula’s first hatted restaurant and given his impressive credentials – he worked for Michelin star restaurants in Europe and Asia, and won two hats at Brisbane’s Watt Dining – it’s not too much of a stretch to think that he could pull it off. 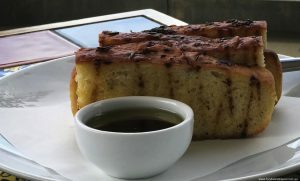 Focaccia with olive oil and cabernet sauvignon vinegar. Harris admires his new employers for making a serious commitment to the business, while they in turn are delighted to have someone of Harris’s calibre on board. “People come here for the view and stay for lunch. 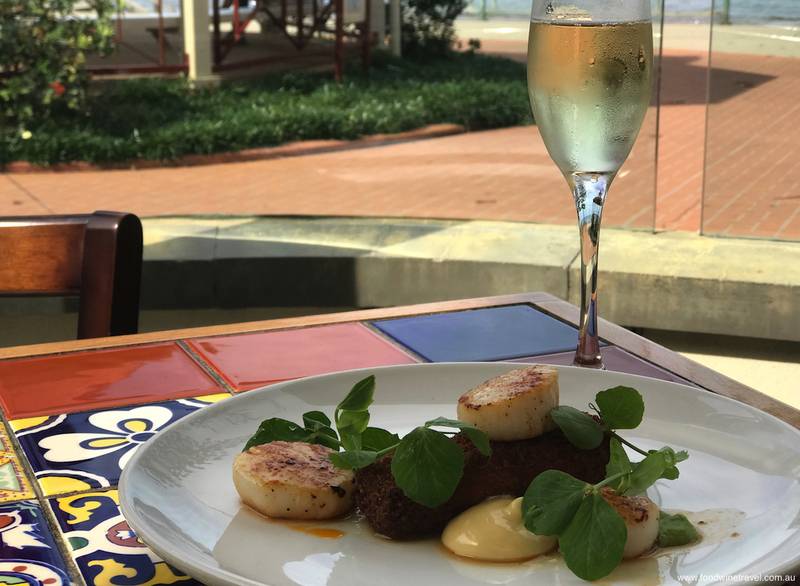 We want them to come for lunch and stay for the view,” says Thomson, who 18 months ago could never have imagined that he’d be in Queensland running a restaurant. 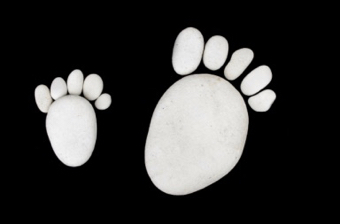 He was on long service leave from his job in Sydney and was making his way up the coast when he was invited to check out a business that he’d heard was for sale. One look at the Pavilion, then known as Pilpel by the Sea, and he was hooked. Few Brisbane restaurants, let alone restaurants on the Peninsula, can boast such a prime beachfront location. The Art Deco style building has views over a beautiful colonial bandstand towards the sea. 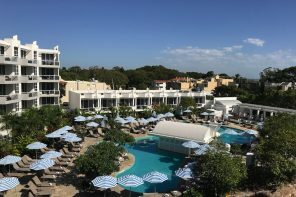 The restaurant and function centre enjoys a prime location on the waterfront. Harris thinks it should be the best restaurant in Redcliffe and that’s what he’s working towards, by seeking out suppliers that deliver him beautiful fresh produce, and by making more of the food in-house. When he took over, cakes sold in the café were brought in from an outside supplier; now all the cakes and bakery items are being made in-house. By the end of this month, everything on the fish shop menu will be fresh; there won’t be any room for frozen fish or prawns. “We’re going to start selling our own focaccia bread in the café. We’ll also be doing sauces for people to buy,” says Harris. The café will sell food to take home, a concept that gladdens my heart because the one thing I’ve always thought the Peninsula lacks is a good deli and/or gourmet food store. Hervey Bay scallops with croquette of ham hock. 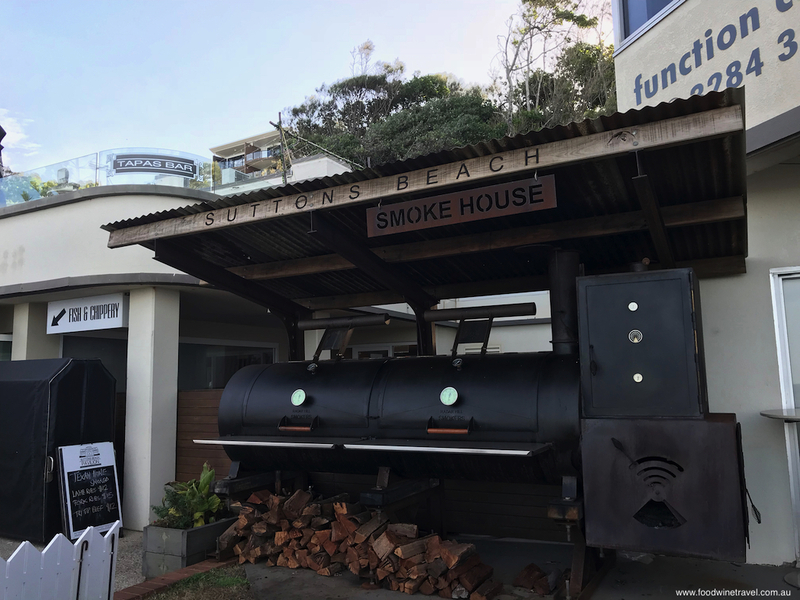 Suttons Beach Pavilion has a number of different facets, which makes Harris’s task a challenge but offers great choice for his customers. The café is a popular spot for coffee and scones or cake. It does some of the best coffee in Redcliffe (in my humble opinion). The fish and chippery is a casual, laid-back affair where you can eat from the paper wrapping while enjoying a first-class view. Upstairs there’s a function centre and bar, where you can enjoy drinks and tapas on the terrace. On Sundays, the smokers out the front are fired up and “Chow Down” held from 12 noon. Always a sell-out event, it has a changing menu of very reasonably priced slow-cooked dishes such as Moroccan lamb ribs and barbecue pork ribs. The Smokehouse is a popular drawcard on Sundays. 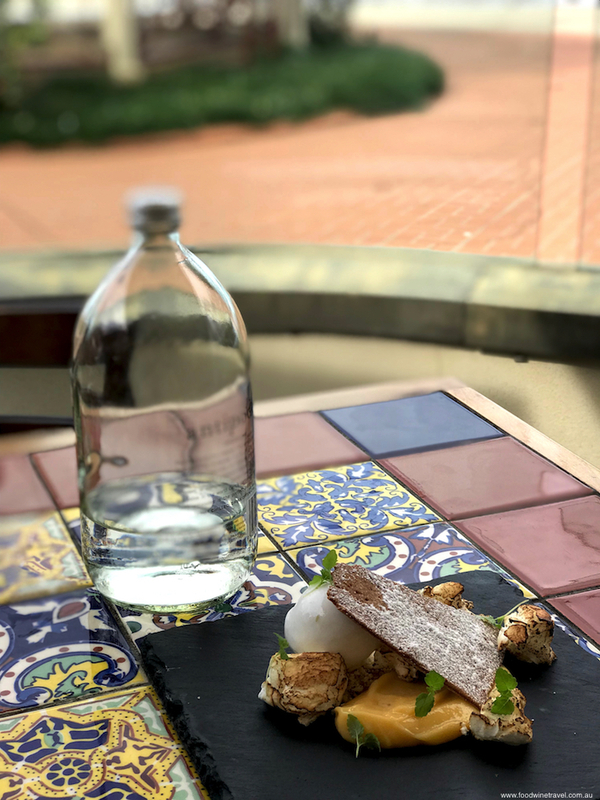 The Pavilion restaurant is open for breakfast, lunch and dinner, and this is where Harris can bring his years of fine dining experience to the fore. 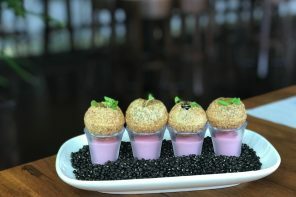 His autumn menu is a mix of meat, seafood and vegetarian dishes, all beautifully presented with a modern touch. We tried a couple of the starters and mains and were very impressed. Salt and pepper king prawns had an Asian-style ginger, spring onion, chilli and macadamia nut dressing, while the Hervey Bay scallops were complemented by a croquette of ham hock, peas and aioli. 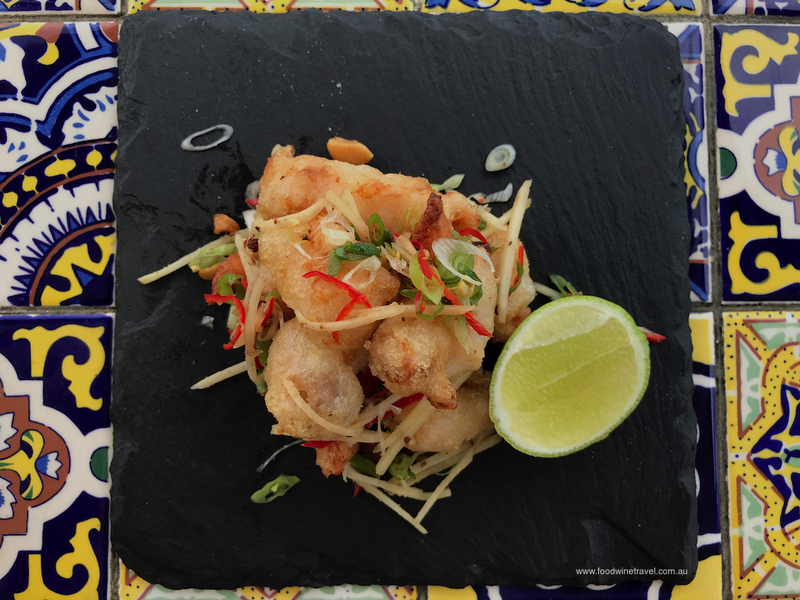 Salt and pepper king prawns, from the new menu. 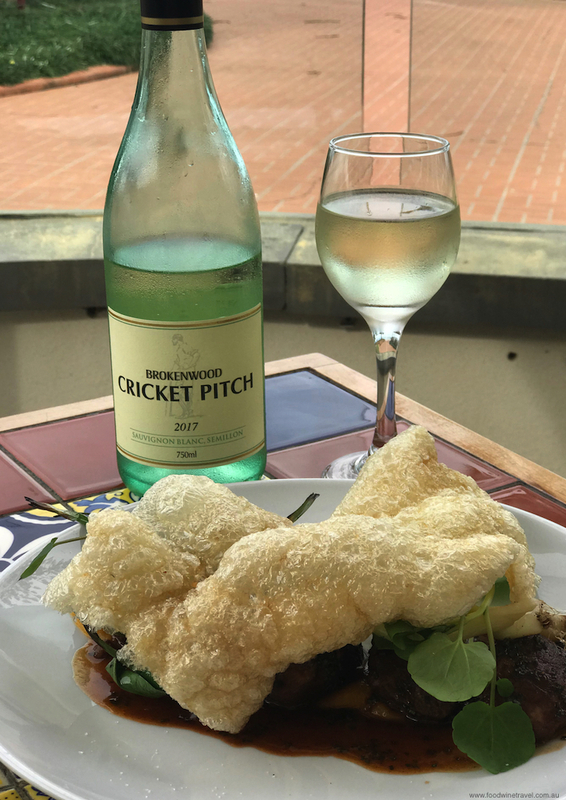 We started with a glass of Redbank bubbles and some of Harris’s freshly baked focaccia (served with olive oil and cabernet sauvignon vinegar) before moving onto a glass of Brokenwood Cricket Pitch Sauvignon Blanc Semillon, a crisp and refreshing match for the seafood. Free-range pork with pumpkin and pork scratching was a nice hearty dish for a cool day, while we loved the flavour of the charred lemon with the generous fillet of Humpty Doo barramundi. Free-range pork with pumpkin and pork scratching. The dessert menu is small but classy, and the Lemon tart with burnt meringue and citrus sorbet was particularly delicious, especially when matched with a glass of delicately sweet Vasse Felix Cane Cut Semillon. 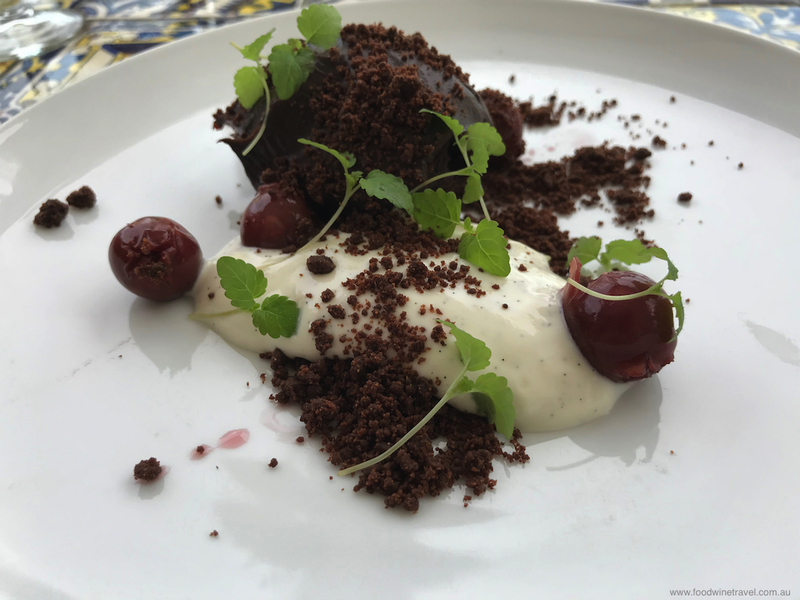 We can also vouch for the Dark chocolate mousse with sour cherries. The menu has burgers, salads and light dishes, as well as a charcuterie board and a cheese board, for diners seeking other options. There are also some good specials: 2-4-$22 on Tuesdays (two main courses from the chef’s selection for $22); Parmy Party on Wednesdays (chicken parmigiana $16); Steak night on Thursdays (300g Black Angus rump, chips and salad $16). Dark chocolate mousse with sour cherries. Harris has had to put in a lot of work to find consistently reliable supplies of quality produce. You wouldn’t think it would be a problem less than an hour’s drive from Brisbane’s CBD, but apparently some suppliers only want to deliver weekly, if at all. 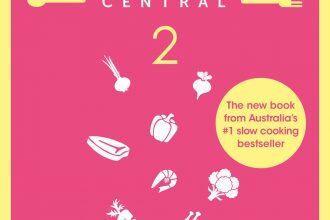 That aside, Harris is very happy with the handpicked herbs and vegetables he is getting from the Petite Bouche farm at Mount Nathan, south of Brisbane. He buys his meat locally from a butcher who smokes his own bacon and hocks. Both Thomson and Harris are convinced that the Pavilion has what it takes to become a destination restaurant. 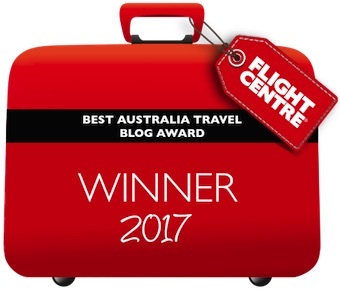 “I think Redcliffe’s a hidden gem,” says Harris. As a Redcliffe local, I couldn’t agree more. Christine and Maurie dined as guests of Suttons Beach Pavilion. Thanks Jens and Mariana. Enjoy your travels! More Recipes From Slow Cooker Central: Creamy Potato Bake, and Bananas in Caramel Sauce.